Globally, there are approximately 40 species of deer, five of which are indigenous to Canada: white-tailed deer, mule deer, caribou, moose, and wapiti. Within Canada, the two most common of these are the white-tailed deer and the mule deer. White-tailed deer (Odocoileus virginianus) can be found in all provinces and territories of Canada except in Newfoundland. Among all large animals in Canada, white-tailed deer are the most widely dispersed and the most numerous. They are also increasingly found near urban areas due to human encroachment into their habitats and new, attractive vegetation, so it is not uncommon for people to come across white-tails. White-tailed deer have a number of natural predators such as the timber wolf, coyote, bobcat, and mountain lion. Fawns and young deer in particular are preyed upon by black bears. However, the number of these predators is decreasing such that they are not as big a threat to deer as they once were. This reduction of natural predators has led to increases in the white-tail population in various areas. Human development can alter deer populations, both increasing and decreasing numbers depending on the situation. On the one hand, human encroachment into deer habitats such as clear cutting and habitat destruction may lower available food sources for deer. This could lead to eating from gardens, venturing onto people’s property, and crossing roadways, all of which increase dangers for people and deer. On the other hand, new sources and different types of food, for example ornamental trees and plants used for landscaping purposes often prove attractive to deer, which may increase potential viable food sources and improve deer survival, but may also increase their presence in human-populated areas. White-tails are skittish and frighten easily. When threatened, they use their speed and agility to flee from danger. Their quick darting movements and fast sprints – up to 48 km/h – across open terrain allow them to quickly escape. However, if the deer feels it has no means of escape, it may attempt to charge at the threat with its antlers or head. The white-tailed deer is known for its excellent jumping capabilities. It can jump upwards as high as 3 m, higher than the typical 2.1 m fences that surround homes. And they can leap forwards as far as 9 m in a single bound. The white-tailed deer is also very agile and can dart back and forth through brush and change direction very quickly, making some of their movements unpredictable. While running, they can reach speeds of 48 km/h. White-tails are crepuscular which means they are most active at dawn and dusk. They can jump upwards as high as 3 m and leap forwards as long as 9 m.
Deer are easily frightened and can rapidly dart in different directions to flee danger. Due to urban development, white-tails are increasingly seen on the outskirts of populated areas and inside suburban neighbourhoods. They can travel up to 48 km/h. White-tails have four stomachs which allow them to eat some poisonous plants. They often leave their fawns alone for several hours at a time, but rarely abandon them. White-tailed deer are the most numerous and dispersed large animal across North America. White-tailed deer are crepuscular animals and are most active at dawn and dusk when they forage for food or move to new areas. They are also active at night and less active during cooler days. During the mating season, referred to as the rut season or rutting, males compete to breed with females. They use their antlers to spar with each other and attempt to establish a hierarchy of dominance among the males. 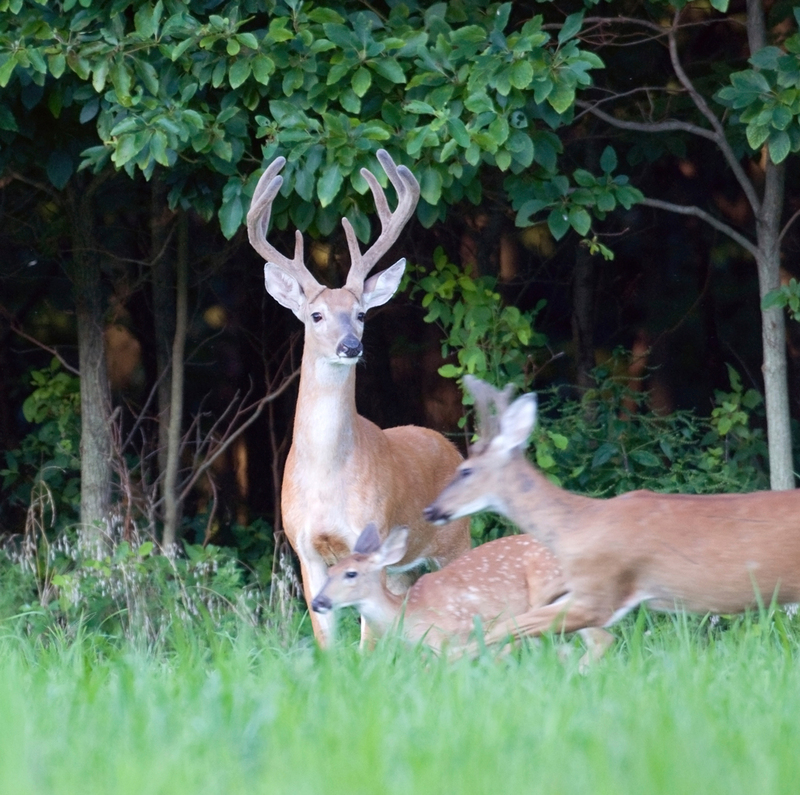 Increased deer movement is typical during the fall months generally from late October to late November. The following spring, in May or June, females will give birth to one to three young. Fawns typically do not move around during their first few weeks, rather they bed down in tall grass or other well camouflaged areas. The female deer will often leave their young unattended during this and other times, returning to the fawn for feedings. Fawns are rarely abandoned by their mothers and therefore people should not attempt to touch or disturb the young animals as the mother is likely to return. Deer are known to ‘freeze and stare’ into the headlights of vehicles. Researchers continue to examine the reasons behind this behaviour; however, studies have suggested that deer are temporarily blinded by the bright light. Deer eyes are designed for low-light conditions coinciding with their most active periods of dawn and dusk. Once blinded, researchers believe that the overstimulation of this sense causes deer to remain still until their eyes adjust or the light source is removed. Additionally, as bright lights are not part of their natural environment it is believed that this confuses deer. Deer also have eyes that are adapted for detecting movement, and approaching headlights have little apparent movement, so it is likely that the staring behavior is an attempt to interpret whether headlights represent an approaching threat or not. The scientific name of the white-tailed deer is Odocoileus virginianus and is sometimes referred to as the Virginia deer. It belongs to the large ungulate mammal group which is characterized by hoofed feet. Male deer are referred to as bucks, females as does, and young are called fawns. Deer typically range in height between 68 and 114 cm at the shoulder. Some male deer have been recorded at weights up to 200 kg. However, the average male deer weighs between 68 and 141 kg. Female deer typically weigh from 41 to 96 kg. The average lifespan of deer is two to three years in the wild, but in good conditions, deer can live up to ten years although there have been reports of a few deer living much longer in captivity. The primary distinguishing characteristic of the white-tailed deer is its tail. When a deer feels threatened or senses danger it will raise and wag its tail, which has white fur on the underside, to warn other deer. The white underside also helps a fawn follow its mother. The overall colour of a deer’s coat is generally red-brown in the spring and summer which turns to a grey-brown during the fall and winter months. 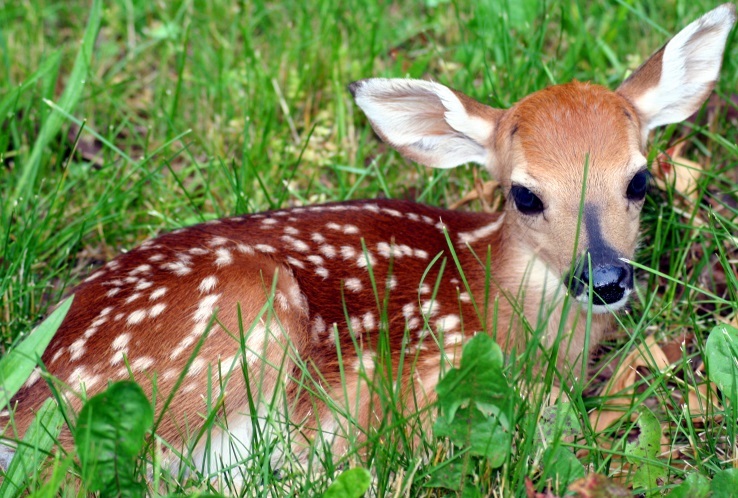 Fawns are born with white spots but they lose these by the end of their first summer. Male deer are further distinguishable by their antlers. They shed and re-grow a new set every year. The main beam of a deer’s antlers grows upwards and slightly outwards from the top of the head with ‘spikes’ that grow straight up from this beam. As deer age, they grow more spikes, often referred to as points, that enlarge the size of the antlers. Although not an exact method, the size of antlers and the number of points are a good indication of deer age. During the growth period, antlers are covered in velvet which peels off in late summer/early fall. This reveals the hard bone underneath in preparation for the fall breeding season. Except in rare cases, female deer generally do not grow antlers. The white-tailed deer is native to North America, all of Central America, and northern areas of South America. These regions are inhabited by different sub-species of the white-tailed deer. Only three sub-species live within Canada: the northern white-tailed deer; the Dakota white-tailed deer; and, the tawny northwestern white-tailed deer. Although white-tailed deer are found across most of Canada, certain areas have lower concentrations of the species than other areas. For instance, British Columbia is mostly populated by the black-tailed deer, a sub-species of the mule deer, which is often mistaken for the white-tailed deer as the differences between the two are subtle. White-tailed deer are found in both fields and meadows, particularly in the warm summer months for foraging, as well as forests and bush area which they use for shelter, particularly in the winter. White-tailed deer also gather along the outskirts of urban areas, leading to increased exposure to human populations. When seasons change, the white-tailed deer may travel long distances to reach a meadow or forested area. White-tailed deer are primarily herbivores that graze on twigs, grass, shrubs, leaves, corn, fruit, and nuts. In addition, they have special digestive systems with four stomachs that allow them to eat foods that other animals and humans cannot eat, such as a variety of mushrooms or poison ivy. Although their diet is largely dependent upon the food sources available within their immediate environment, they sometimes travel to find other food sources. Canadian Geographic. Animal facts: White-tailed deer. Geist, V. (2012). Deer. The Canadian Encyclopedia. National Geographic. White-tailed deer: Odocoileus virginianus. Nature Works. White-tailed deer – Odocoileus virginianus.